Starting today, and the first Wednesday each month, I’ll be writing a column called “The View From the Executive Director’s Desk.” It will be part update on what’s going on behind the scenes here at Strong Towns and part topics I’m personally involved in that relate to our mission. We have several huge organizational announcements in their final stages of development and this will be place where all of those get unveiled as they are ready. As for my pet topics, the list includes things like local food production and distribution, the architecture of adaptable housing fabric, resilient landscaping, and tactical urbanism projects in my neighborhood. I’ve also had the chance to travel to some international cities this year and elements from those visits will likely find a place to shine here as well. First off today, I am very excited to announce our Strong Towns fall schedule of events. It is anchored by weeklong Curbside Chat tours in two states we have yet to reach, Wyoming and Mississippi. In three more states and one province, we’ll be making our first public appearances: West Virginia, Oklahoma, Wisconsin, and British Columbia. And to round out the schedule, there will be one day engagements in Pennsylvania, Indiana, North Carolina, Kansas, Florida, New Jersey, Washington and New York. There are a couple of more states being finalized and we’ll add those as they confirm. To perhaps cure the disappointment that Strong Towns will not be visiting a town near you these last few months of the year – fret not! As we’ve already stuffed our travel calendar as full as possible in 2013, I will be starting this week to look ahead to the first half of 2014. This is where we need your help. We need assistance funding Curbside Chat visits via individual event sponsorships. Texas is a huge focus in the first quarter as we are hoping to hit Dallas/Fort Worth, Austin, San Antonio and Houston. It’s been a long time since we’ve seen our friends in New England and California, and so those two regions are next on our radar towards spring and summer. We’ve already got some leads in Washington and Montana to do multi-day events there, but we are always looking to add more. Since I know we haven’t mentioned all 50 states yet in the column, if you are in that remainder, please give me a call at the Strong Towns office. I’ll be reaching out to many of our key volunteers and ardent supporters this month and I’d love to talk to you, too. We’d love to come to your town and just need to figure out a way not to go broke while doing it. As we are keeping our expenses here at Strong Towns as low as possible, I’m currently working from my house in a walkable, urban neighborhood in south Minneapolis called Kingfield. Here’s where The View comes in. My office is on the second floor and so can see out the window into my entire backyard and alley from my desk. My wife and I have worked hard this spring and summer to expand our vegetable garden across half of our lot and also hired a contractor to fix some grading problems in the other half of our yard. It’s been a constant war zone out there for 4 months now. But as things are wrapping up, I can look out at our hard work (and tasty work as harvest is coming in) and feel a sense of pride and joy at what we’ve accomplished. While that view is gorgeous, the view just beyond it is not so much. Out beyond our property line lies the intersection of two busy city streets (blocked in part by that big tree), one of which leads to the interstate highway. During the last 40 years, the push to accommodate more and more room for cars STROAD’ified the intersections in many places of the city street grid. The land use around it followed, taking down productive buildings and putting back much bigger parking lots around the new buildings. I have to cross that intersection to walk to my bus stop, local coffee shop, hardware store, and barber shop. It is not anywhere near as pleasant as walking in other directions to places nearby. This fall, I’m starting a process with my neighborhood examine how we want to see our future as a neighborhood. This intersection will be part of that discussion. I’m not sure how that process will go, but I know that by being involved, I can help shape the outcome. The view out my office window is a constant reminder to me that like my garden, it is going to take hard work, day after day, in order to make more productive and beautiful places. Sometimes it’s messy. Sometimes we can’t quite envision how it’s going to turn out in the end. Sometimes we get worried that we will never make it where we are going. 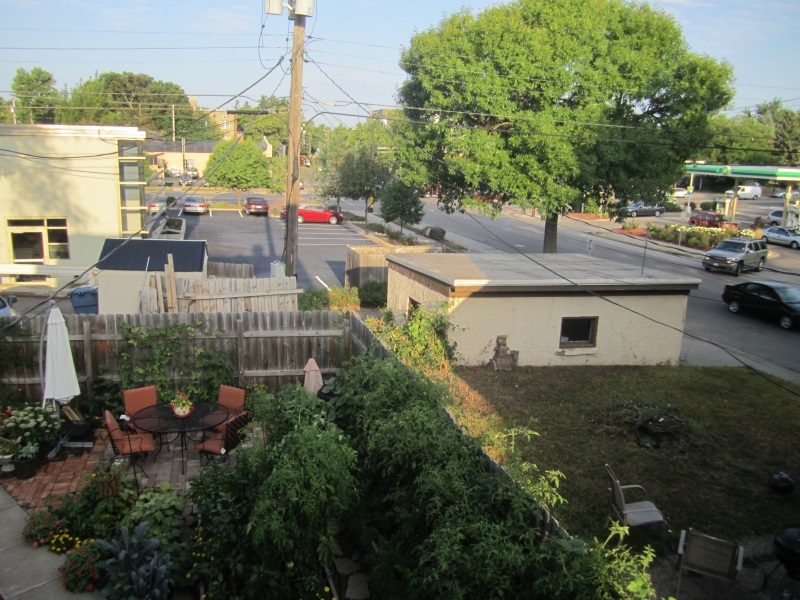 However, garden by garden, lot by lot, intersection by intersection, neighborhood by neighborhood, each of us has the ability to contribute to making the place we love, a Strong Town. Look out your window today and see what you can do to get started.